Illustration from The Circuit Rider: A Tale of the Heroic Age by Edward Eggleston depicting a Methodist circuit rider on horseback. Circuit rider is a popular term referring to clergy in the earliest years of the United States who were assigned to travel around specific geographic territories to minister to settlers and organize congregations. Circuit riders were clergy in the Methodist Episcopal Church and related denominations. In sparsely populated areas of the United States it always has been common for clergy in many denominations to serve more than one congregation at a time, a form of church organization sometimes called a "preaching circuit". In the contemporary United Methodist Church, a minister serving more than one church has a "(number of churches) point charge". However, in the rough frontier days of the early United States, the pattern of organization in the Methodist Episcopal denomination and its successors worked especially well in the service of rural villages and unorganized settlements. In the Methodist denominations, congregations do not "call" (or employ) a pastor of their own choice. Instead, a bishop "appoints" (assigns) a pastor to a congregation or a group of congregations, and until late in the 20th century, neither pastor nor congregation had any say in the appointment. This meant that in the early days of the United States, as the population developed, Methodist clergy could be appointed to circuits wherever people were settling. A "circuit" (nowadays referred to as a charge) was a geographic area that encompassed two or more local churches. Pastors met each year at "Annual Conference" where their bishops would appoint them either to a new circuit or to remain at the same one. Most often they were moved to another appointment every year. (In 1804, the Methodist Episcopal General Conference decreed that no pastor was to serve the same appointment for more than two consecutive years.) Once a pastor was assigned a circuit, it was his responsibility to conduct worship and visit members of each church in his charge on a regular basis in addition to possibly establishing new churches. He was supervised by a Presiding Elder (now called a District Superintendent) who would visit each charge four times a year (the "Quarterly Conference"). Because of the distance between churches, these preachers would ride on horseback. They were popularly called circuit riders or saddlebag preachers. These frontier clergy were never officially called "circuit riders", but the name was appropriate and it "stuck". Officially they were called "traveling" clergy (a term that is still used in Methodist denominations). They traveled with few possessions, carrying only what could fit in their saddlebags. They traveled through wilderness and villages, they preached every day at any place available (peoples' cabins, courthouses, fields, meeting houses, later even basements and street corners). Unlike clergy in urban areas, Methodist circuit riders were always on the move. Many circuits were so large that it would take 5 to 6 weeks to cover them. The ministerial activity of the circuit riders boosted Methodism into the largest Protestant denomination at the time. In 1784, there were 14,986 members and 83 traveling preachers. By 1839, the denomination had grown to 749,216 members served by 3,557 traveling preachers and 5,856 local preachers. And loved and blessed them all in death. Francis Asbury (1745–1816), the founding bishop of American Methodism, established the precedent for circuit riding. Together with his driver and partner "Black Harry" Hosier, he traveled 270,000 miles and preached 16,000 sermons as he made his way up and down early America supervising clergy. He brought the concept of the circuit from English Methodism, where it still exists: UK Methodist churches in England are grouped in circuits, which typically include a dozen or more churches, and ministers are appointed ("stationed") to the circuit, not to the local church. A typical English circuit has two or three times as many churches as ministers, the balance of the services being led by lay Methodist local preachers or retired ("supernumerary") ministers. The title circuit rider, however, was an American coinage born of American necessities. Although John Wesley, the founder of Methodism, covered enormous distances on horseback during his career, and early British Methodist preachers also rode around their circuits, in general they had far less formidable traveling commitments than their American counterparts. It makes sense to date the beginning of circuit riding at the Christmas Conference of 1784, but it is much more difficult to date the end of circuit riding because it was never an official category of ministry, so it never appeared in Annual Conference records. The U.S. census eliminated "frontier" as a category in 1890, but the need for "old fashioned" circuits generally ended much earlier, sometime before the U.S. Civil War. Whenever Methodist Episcopal congregations became well established, bishops would appoint clergy to groupings of small congregations rather than the territories to which earlier clergy had been appointed. Of course, this development moved west as the U.S. frontier moved west. As well as being constantly on the move between the churches in their charge, Methodist ministers were regularly moved between charges, a principal known as itinerancy. Although most charges in the US now consist of a single church, the tradition of itinerancy is still alive and functioning today in US Methodism, as it is in most Methodist Churches worldwide. Although not moving as frequently as in the past, the average US United Methodist Church pastor will stay at a local church for 2–5 years before being appointed to another charge at the Annual Conference (although technically, every pastor is assigned to a charge every year, it is just usually the same one). In British Methodism, ministers are normally appointed to a circuit for five years (again, they are stationed there annually by the Conference); the Conference may not station someone beyond this period without an invitation from the Circuit Meeting for that minister to remain in the circuit, but it is unusual for a minister to stay for longer than seven or eight years in one circuit. The saying in the church is, "After seven years, if the person's any good, it's time someone else had them; and if they aren't any good, it's time someone else had them!" 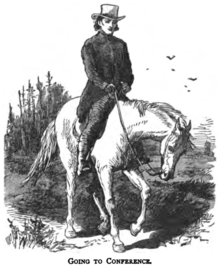 Possibly the most famous circuit rider was Peter Cartwright who wrote two autobiographies. John B. Matthias was an early circuit rider from New York state who is credited with having written a gospel hymn, "Palms of Victory." Wilbur Fisk, who became an educator, served as a circuit rider for three years. It was not uncommon for clergy to serve on circuits for a few years and then go to other work. Joseph Tarkington, a circuit rider in Indiana, was the grandfather of novelist Booth Tarkington. William G. "Parson" Brownlow, Tennessee's radical newspaper publisher, noted book author, American Civil War-Reconstruction Era Tennessee governor, and U.S. Senator, began his career as a circuit rider in the 1820s and 1830s. Brownlow gained wide notoriety for his wild clashes --- both in person and in print --- with rival Baptist and Presbyterian missionaries and Christian sectarian authors across the Southern Appalachian region of the United States. Brownlow's books detailing the Confederate States of America military occupation of his hometown of Knoxville, Tennessee, and his own time briefly spent in a Confederate prison during the American Civil War gained Brownlow a greatly expanded audience across the northern United States who were eager to purchase both his books and admission tickets for his northern U.S. speaking tour during the later years of the American Civil War. The father of outlaw John Wesley Hardin, James "Gip" Hardin, was a Methodist preacher and circuit rider in the mid-1800s. Hardin's father traveled over much of central Texas on his preaching circuit until 1869 when he and his family settled in Sumpter, Trinity County, Texas where he established a school – also named for John Wesley, the founder of Methodism. Thomas S. Hinde, was a Methodist circuit rider in Illinois, Indiana, Kentucky, and Missouri from the early 1800s until about 1825 when he eventually settled in Mount Carmel, Illinois the town he had earlier founded. Hinde was a notable minister, newspaper publisher, attorney, real estate entrepreneur, and clerk for the Ohio House of Representatives. Over 47 volumes of his personal and business documents are among the Lyman Draper collection at the Wisconsin Historical Society, since they were donated after his death by his son in law Charles H. Constable. In retrospect, the circuit rider became a romantic figure and was featured in a number of novels in the late 19th and early 20th centuries. Two of the better known novels are Edward Eggleston's The Circuit Rider. and Ernest Thompson Seton's Preacher of Cedar Mountain. A circuit rider is also a character in the Newbery Award–winning novel for children, "Caddie Woodlawn", set in western Wisconsin in the 1860s. During the 1970s, prior to its sign-off message Richmond, Virginia television station WWBT broadcast "Justice and The Circuit Rider", a rural preacher appearing on his mount, Justice, and presenting a brief parable using props from his saddlebag. These spots also appeared on the Richmond ABC affiliate WXEX, now operating as WRIC-TV just after the end of "Shock Theater". In these short films, the host was identified only as the Circuit Rider from Cobbs Creek, Virginia at the end of the three-minute segment. The preacher was William B. Livermon, Sr., who served several Virginia churches during his lifetime before passing away in 1992. The first person accounts of pioneer circuit riders give insight to the culture of the early United States as well as the theology and sociology of religion (and especially Methodism) in the young nation. Quite a few circuit riders published memoirs. These are generally available in the collections of United Methodist seminary libraries. The United Library of Garrett-Evangelical Theological Seminary and Seabury-Western Theological Seminary (Evanston, Illinois) seems to have the largest collection of these writings, including over 70 items. Through his role as chairman of the United Methodist editorial committee in Shreveport, Louisiana in the latter 1970s, the historian Walter M. Lowrey spearheaded a project, A History of Louisiana Methodism, which includes material on the church's extensive network of circuit riders. ↑ Hyde, A. B. The Story of Methodism (revised edition). Springfield, Mass: Willey & Co., 1889, p. 470. The 1887 edition is available as a Google Book. ↑ Gaustad, Edwin Scott. Historical Atlas of Religion in America. New York: Harper and Row, 1962, pp. 77–78. ↑ Porter, James. A Compendium of Methodism. New York: Carlton & Porter, 1851, p. 134. The 1853 edition is available as a Google Book. ↑ Porter,James. op. cit., p. 160. ↑ Christ-Janer, Albert, Charles W. Hughes, and Carleton Sprague Smith. American Hymns Old and New. New York: Columbia University Press, 1980. p.380. ↑ For any specific area of the U.S., this development can be traced in the Methodist "Annual Conference Journals", available in the libraries of United Methodist seminaries. ↑ Cartwright, Peter (Ed. W. P. Strickland). Autobiography of Peter Cartwright the Backwoods Preacher. Cincinnati: Cranston and Curts, 1856; Cartwright, Peter (Ed. W. S. Hooper). Fifty Years as a Presiding Elder. Cincinnati: Hitchcock and Walden, 1871. ↑ For genealogical information see http://wc.rootsweb.ancestry.com/cgi-bin/igm.cgi?op=GET&db=geolarson2&id=I049057. Also see Autobiography of Rev. Joseph Tarkington, One of the Pioneer Methodist Preachers of Indiana. Cincinnati: Curts & Jennings, 1899. ↑ "William Gannaway 'Parson' Brownlow," Tennessee Encyclopedia of History and Culture. Retrieved: 5 May 2014. ↑ Brink, Carol Ryrie. Caddie Woodlawn. New York: Simon & Schuster, 1935. ↑ Callis, Rita A. (1992). "William B. Livermon, Sr., 1916–1992". Memoirs from the 1992 Journal of the Virginia Annual Conference. Virginia Conference of the United Methodist Church. Retrieved 2009-04-21. ↑ "Louisiana Commission on Archives and History". iscuo.org. Retrieved March 23, 2011. ↑ "Methodist Circuit Riders". centenary.edu. Retrieved March 23, 2011. Bangs, Nathan. The life of the Rev. Freeborn Garrettson [1752–1827], 1845. 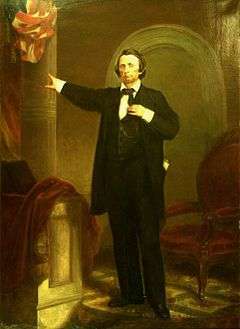 Dyer, John Lewis, 1812–1901. The Snow-shoe Itinerant : An Autobiography of the Rev. John L. Dyer, Familiarly Known as "Father Dyer" of the Colorado Conference, 1890. Finley, James Bradley, 1781–1856 (W. P. Stricklkand, Ed.). Autobiography of Rev. James B. Finley, or, Pioneer Life in the West, 1856. Caughey, James, 1810?–1891. Earnest Christianity Illustrated, 1855. Peterson, Daniel H. The looking-glass: being a true report and narrative of the life, travels and labors of the Rev. Daniel H. Peterson, a colored clergyman; embracing a period of time from the year 1812 to 1854, and including his visit to western Africa, 1854.